This building at Dakota and Aluminum streets served as the Welsh Presbyterian Church from its opening in 1909 until 1946. A Welsh headstone stands at Mount Moriah Cemetery. This note in the Butte Daily Post on March 1, 1887, is the first known local mention of St. David's Day. A story announcing the opening of the Welsh Presbyterian Church ran in the Butte Miner April 4, 1909. On Saint David’s Day, March 1, 1961, The Montana Standard interviewed 81-year-old John Meredith Jones of West Aluminum Street, one of the last surviving Welsh-born immigrants in Butte. In the interview, Mr. Jones spoke wistfully of previous Saint David’s Day celebrations, when hundreds of Welsh men and women would wear daffodils, the national flower of Wales, and choirs would raise the rafters of the Welsh Presbyterian Church at Dakota and Aluminum. He lamented the decline of the community that had once thrived around the church and particularly the loss of the language that in previous decades had been heard throughout the city. In 1961, he estimated, there were about “15 or 20” Welsh speakers left in Butte. John Jones came to Butte in 1908, but his family’s history in the city starts with the arrival of his half-brother Stephen Henry Northey in 1885. A further three siblings preceded John, and their combined stories span 80 years of Butte history, charting the establishment, brief ascendance, and gradual decline of the city’s Welsh community. Stephen Northey was typical of the early Welsh immigrants in Butte. Raised in the lead-mining town of Halkyn in North Wales, his mining career had seen him travel as far afield as India and British Columbia before he finally settled in Butte. There were many others like him in the 1880s, a testament to the links that had been forged between Butte and Wales in the early days of the copper camp. Before the construction of the smelter at Anaconda, tens of thousands of tons of Butte’s ore had been shipped to the South Wales city of Swansea, a 4,500-mile journey by rail and sea that beggars belief even today. By the late 1880s, there was a distinctive Welsh presence in Butte. The Welsh Republican Club was established in 1886. The Saint David’s Society was founded the following year, and Butte’s first Saint David’s Day celebrations were held at the Renshaw Hall on Park Street on March 1, 1887. It would remain a feature of the city’s social calendar for the next fifty years. And this presence did not go unnoticed beyond Butte. In August 1890, the United States’ only Welsh language newspaper, New York’s Y Drych (The Mirror) published a lengthy profile of this rare western outpost of Welsh language and culture. Butte’s postmaster was John G. Evans of Maesteg, its Sheriff John E. Lloyd of Saundersfoot. Lloyd, whose biography reads like a dime Western, appointed two fellow Welshmen, Thomas Richards and Jeremiah Griffiths, both of Dowlais, as his deputy and jailer respectively. It seems that before the advent of the archetypal Irish cop, there was a Welsh posse maintaining law and order in Silver Bow. Stephen Northey found a home in this community. 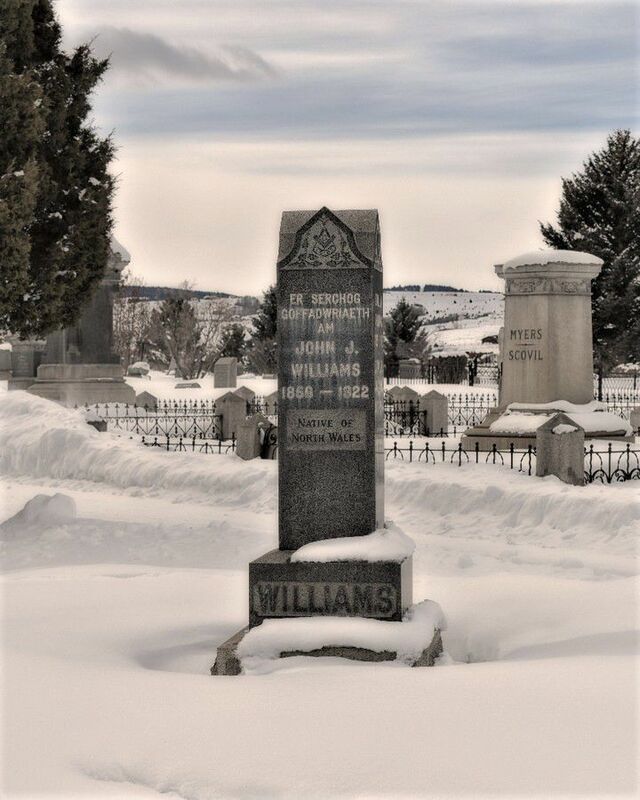 He married Margaret Lewis of Carmarthenshire in Butte in 1889, and by the time he was naturalized in 1894, he was a father to two young children. His name appears regularly in the newspapers of the day as an expert witness in court cases, as an aspiring but ultimately unsuccessful Republican politician, and as an active member of numerous Welsh societies. They established a very visible and vocal congregation, initially at the Carpenters Union Hall on Granite Street, before moving to the Odd Fellows Hall on Broadway, where alongside services they also held Sunday schools and Welsh classes. In September 1904, The Anaconda Standard noted that Stephen Northey had left Butte for a trip to the United Kingdom. The nature of this trip went unreported, but it can be no coincidence that just eight months later, three of his half-siblings disembarked at Ellis Island, their destination Butte, Montana. They were followed by their older brother John in 1908. His arrival; Stephen Northey’s sudden death in January 1909, aged just 47; and the long-anticipated opening of the Welsh church later that year, combined to herald a new chapter in Butte’s Welsh story. Before the church, the Welsh population had been scattered throughout city, but in the decades following its foundation, the streets around Dakota and Aluminum would be referred to in the press as “Butte’s Welsh colony” and were notable for the predominance of the Welsh language. When the chapel opened its doors on April 4, 1909, all of its services were delivered in Welsh, and it was claimed that the area from Placer Street to West Iron was the only neighborhood west of Chicago where Welsh was widely spoken as a first language. The decades that followed were arguably the heyday of the Welsh in Butte, a tight-knit and distinct community, lauded for its industriousness, piety, and musicality. Scanning the newspapers of the day, there is no hint of scandal, just eminently respectable reports of operettas, fundraisers, and ladies' evenings and of course the annual Eisteddfods and Saint David’s Day celebrations. Naturally there were exceptions to this sober image. Hugh Evans of Bala would be immortalized in the 1943 book "Copper Camp" as "Hughie Evans the Welsh butcher," a man so fond of a drink he would leave his store unattended, pinning a sign to the door which read "Help yourself." But even Hughie sang in the church choir. The Jones brothers, John, Thomas, and George, were at the heart of the community throughout this period. John became the church superintendent within a year of its opening, and he would remain its musical director for 25 years. He was well known throughout Butte as the “silver-tongued Welshman” and was in demand as an arranger and soloist throughout southwest Montana. It is doubtful than any of these people would have sensed that this heyday would soon become a swan song. But the sense of permanence afforded by the church proved to be an illusion. It might even be said that the fate of the Welsh community was inevitable. The smallest and least populous of the three Celtic nations, Wales never experienced emigration on the scale of Ireland and Scotland, and while its population grew steadily in Butte at the start of the twentieth century, others soared. The Welsh were outnumbered and to some extent consumed by these much larger groups. The strong sense of identity celebrated in 1890 gradually dissipated over the following decades. Even among those who married within their own ethnic group, which included the Northey and Jones siblings, there is a feeling of something ephemeral. As these original Welsh immigrants passed away, the language and sense of identity was lost with them. Their children married into other communities or in many cases left the city behind altogether. The road from Butte to Seattle was particularly well traveled by those second-generation Welsh-Americans in the 1940s and 1950s. The Welsh Presbyterian church closed its doors for the last time on Sunday, Dec. 29, 1946, its remaining congregation joining the English-speaking First Presbyterian church at Broadway and Idaho. The Saint David’s Day celebrations dwindled in size then disappeared altogether. By the 1960s, as evidenced by the interview with John Jones, the “Welsh colony,” along with its unique language and culture, was little more than a memory for a handful of aging immigrants. By the end of the decade, even that memory had faded. The fate of Butte’s Welsh community is hardly unique. It is a tale that can be told of countless smaller ethnic communities throughout the country. It might even be lauded as an example of successful assimilation. But it is hard not to feel a sense of loss. Today the Welsh are all too frequently filed under “other” (or even worse, “British”) when discussing Butte’s immigrant heritage. Their influence in shaping the city in its early days is overlooked, and the “Welsh colony” is largely unheard of. And yet today there remain many people of Welsh lineage in Butte, even though they might not know it. On this Saint David’s Day, if you’re an Evans or an Edwards, a Jones or a Williams, a Lloyd or a Morgan or a Rees, I’d invite you to pause for a rare moment’s remembrance of these long-forgotten men and women. Colin Hanson is originally from Liverpool, England. He immigrated to the United States in 2011, and became a citizen in 2016. He and his wife Michelle visited Butte in 2017 to research her ancestry, and they fell in love with the city and moved here.